The bread and butter of the terran army, the marines are the first line of defence for most of the planets within the Dominion. Armored with NBC ( Nuclear, Biological, Chemical ) shielding and full life support systems for hostile planetary conditions, the marines can quickly react to hostile situations. 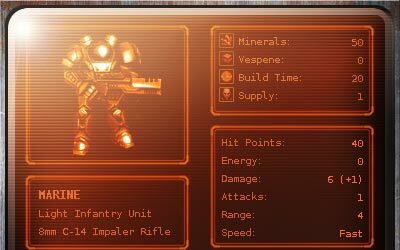 Terran marines are normally armed with C-14 Impaler gauss rifles that fire 8mm metal "spikes" at hypersonic speeds.